Collagen type I fibrillogenesis observed at pH 7.3 (PBS buffer, 0.2 M KCl). Fibrillar collagens, such as collagen type I, belong to the most abundant extracellular matrix proteins and they have received much attention over the last five decades due to their large interactome, complex hierarchical structure and high mechanical stability. Nevertheless, the collagen self-assembly process is still incompletely understood. Determining the real-time kinetics of collagen type I formation is therefore pivotal for better understanding of collagen type I structure and function, but visualising the dynamic self-assembly process of collagen I on the molecular scale requires imaging techniques offering high spatiotemporal resolution. Fast and high-speed scanning atomic force microscopes (AFM) provide the means to study such processes on the timescale of seconds under near-physiological conditions. In this study we have applied fast AFM tip scanning to study the assembly kinetics of fibrillar collagen type I nanomatrices with a temporal resolution reaching eight seconds for a frame size of 500 nm. By modifying the buffer composition and pH value, the kinetics of collagen fibrillogenesis can be adjusted for optimal analysis by fast AFM scanning. 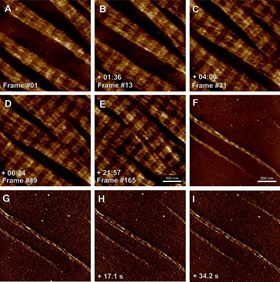 We furthermore show that amplitude-modulation imaging can be successfully applied to extract additional structural information from collagen samples even at high scan rates. Fast AFM scanning with controlled amplitude modulation therefore provides a versatile platform for studying dynamic collagen self-assembly processes at high resolution. This paper was originally published in Ultramicroscopy, 149 (2015), Pages 86–94.